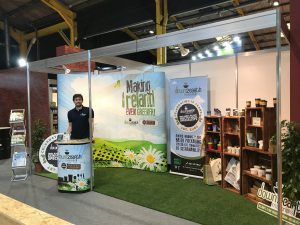 The dust has settled and our feet have finally recovered after this year’s Catex Exhibition in the RDS, and we must say that it was one to remember. The scale, layout and effort gone into this year’s exhibitors stands was amazing. It really made it a pleasurable and memorable few days for exhibitors and punters alike. We had a record number of visitors to our stand this year, it was really encouraging to see how the compostable message has now come to the forefront and is in high demand from retailers and their customers alike. 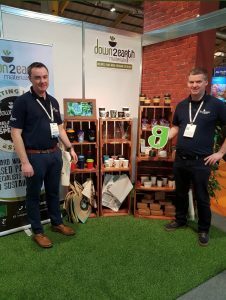 It was a particularly special one for us, we celebrate 10 years in business this year, making us Ireland’s original and leading supplier of plant-based packaging. We have been pushing the sustainable option and really working hard on educating our customers and the public on the benefits of using plant-based packaging. And to see the popularity and demand for certified compostable products made us proud. Our next door neighbours this year we’re our friends at BWG Foods, they had an amazing display with an interactive presentation at their NOMLAB Sensory Bar, Professor Charles Spence travelled from Oxford University to present this and fill you in on the future of food and flavour! It was fantastic and very original! To celebrate the 10 years, we offered new visitors to our stand the chance to win 5,000 custom branded cups for their business. This will be a great introduction for them into the beauty of compostable products, we had a great response to that and will announce a winner in the coming week. As a parting note, thank you to all of you who popped by and had a chat with us over the few days. We took away some great feedback and we really enjoyed talking to you all and we look forward to following up with you all! Now, back to planning for the next one!